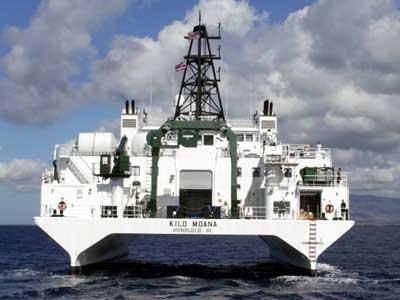 The twin-hulled UNOLS research vessel Kilo Moana, based in Hawaii, was used for MARGINS Source-to-Sink field work in the New Zealand focus site in early 2005. Operations included CHIRP and multibeam surveys and sediment coring. Image courtesy of JP Walsh, ECU.